Near Earth Objects (NEOs) are asteroids or comets whose orbits sometimes take them close to the earth's orbit. An NEO could therefore someday collide with the earth -- and there are almost 7000 of them known, with several times that many predicted to exist. The impact of even a one-kilometer-sized NEO would probably destroy an average state. The 1908 Tunguska event that flattened over 2000 square kilometers in Russia was by some basic estimates caused by an asteroid only 60 meters in diameter. Congress has therefore mandated a ten-year goal of cataloging 90% of the total number of NEOs larger than 140 meters in diameter. It is relatively easy to detect an NEO in visible light by watching its movement across the sky from night to night. Measuring its size, however, is much more difficult. The problem is that the optical brightness of an NEO is the result of both its size and reflectivity ("albedo") - and it is not possible to determine an asteroid's size from its optical brightness alone. To date, only about 1.5% of NEOs have size measurements, and many of these are the relatively large ones. Astronomers predict that there are more than ten times as many NEOs with 100 meter diameters as with one kilometer diameters although, since the damage caused scales roughly as the volume of the asteroid, the 100 meter ones are 1000 times less destructive. CfA astronomers Joe Hora, Giovanni Fazio, Howard Smith, and Tim Spahr assembled a team of sixteen astronomers to study NEOs at infrared wavelengths where NEOs emit their own radiation as well as reflect sunlight. The infrared brightness, when combined with the optical value, enables scientists to infer both size and albedo. Moreover, since the albedo is a property of the asteroid surface characteristics (solid? rubble-pile?) 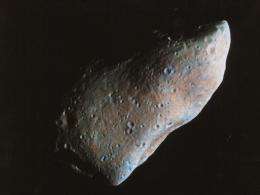 and mineralogical composition, the result helps to determine the asteroid's nature, and from that perhaps where it originated in the solar system, and how it has evolved. Using the Infrared Array Camera on the Spitzer Space Telescope, the team has undertaken a program to characterize 700 NEOs, a dramatic increase over the number now known. In their first paper on this ongoing project the team announced the initial results: nearly half of the objects have diameters smaller than one kilometer, with the smallest one being only about 90 meters across. They report that the data so far suggest that the smaller NEOs are not only more abundant, they appear to have gone through processes in the solar system that make them slightly less populous than expected from extrapolating the statistics of large NEOs. Not least, the astronomers conclude from the surface conditions that these small asteroids are probably young -- perhaps even less than one million years old. The results represent a dramatic contribution to the difficult challenge posed by Congress to characterize most of the potentially dangerous near earth objects, and improve our understanding of what ongoing physical processes have been shaping the solar system since it settled down about 5 billion years ago. "Potentially dangerous." I hate that phrase. It's hard to find the word "dangerous" without that parasite attached to it. Something is either dangerous or it isn't. Danger is, by definition, the potential for harm, so "potentially dangerous" is redundundant. There. Now I feel better.